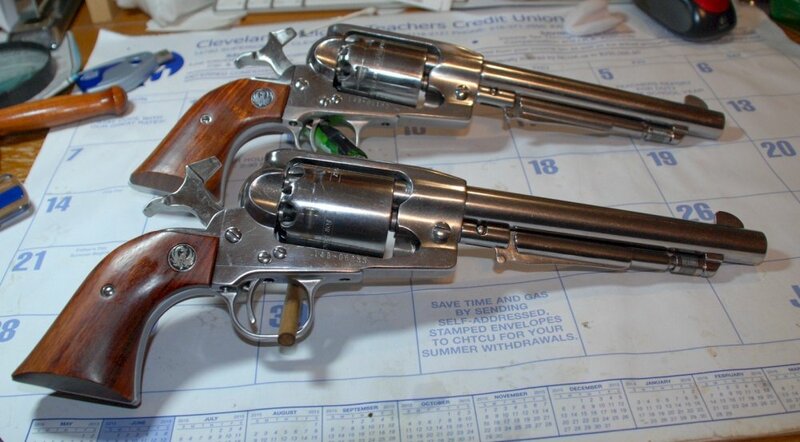 These guns were purchased from Boomstick Jay. I realized after I took the pictures, that I left the loading plungers off. Of course, they will be on the guns! Tuco: " When you have to shoot, shoot, don't talk." Yep, I have way too many Old Armies -- I'll still have a bunch if I sell these. I've never met an ROA or a USFA that I didn't like & want! Howdy Dawg..I've learn't something..I didn't realise SB hammers fit the ROA's...are there alterations to fit ? The smith removes the hammer spur from a SBH hammer and welds it on to the ROA hammer. 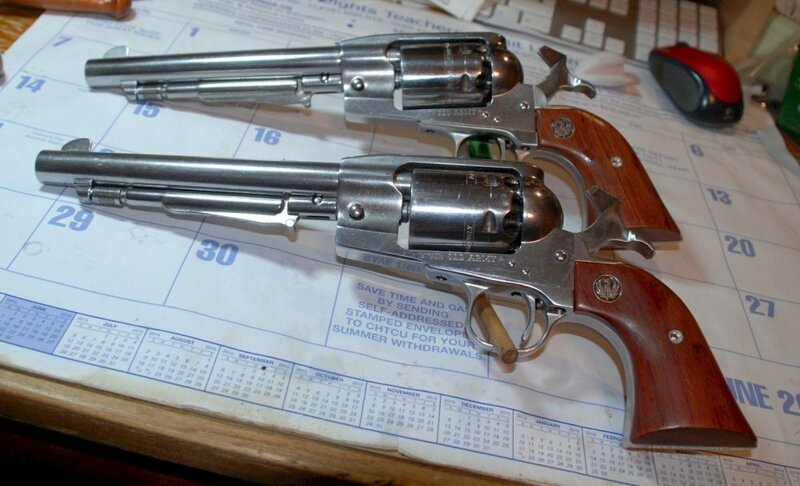 He's Selling Some Ruger Old Army's ? Iffen you cut the barrels you’d ruin the romance. Hey -you said you have a bunch to sell- anything with the lower hammers and shorter barrels? Hey Dawg...Iffin' you don't sell them ..send em' to me & I will take real good care of them..promise !! Sir, these would be my first adventure into BP. Are there any additional modifications you would suggest, and who could I get to complete those modifications? Sent ya a reply to your PM. Nothing needs to be done tho these. Boomstick Jay did a perfect job setting them up. Celebrate with a new-2-u set of fine Frontiersman guns! Any schedule that suits you!